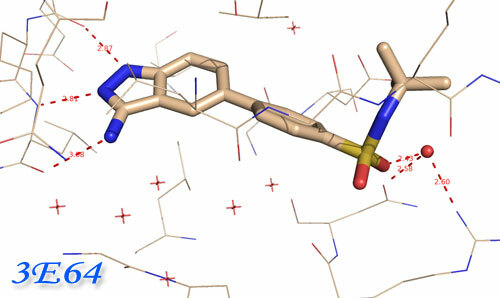 c-Met + pyrimidone: 2RFN; Amgen <- Clearly the highlight of the day, but no image from me yet. I’m looking at it wondering where did all the polar contacts go? Peculiar structure, but noteworthy as the first published structure in the xl-880/kirin/bms/genentech/array/methylgene acyl urea isostere genre. Schering-Plough has a series of CDK inhibitors of which the latest installment is: US20070066621. Earlier app’s in this series appear as a combined effort via SP and PCOP, and Pharmacopeia has a press release suggesting that the collaboration has an oncology candidate in Ph1. Hrmph, No ph1 oncology trials via ScheringP in the US and the press on this stuff is a little thin. press release and an ‘old’ J Med Chem. Hi again Cyclacel, Good idea to cover the pyridines too. Thanks for giving us the data. And hey, it appears you can walk around the activity wheel a little by varying the amine portion of the aminothiazole, but less then 10-fold over all the CDKs and GSK3 / Aurora? Unless your not showing us your ace, it makes Kinasepro wonder just how selective your PLK1 inhibitors are. 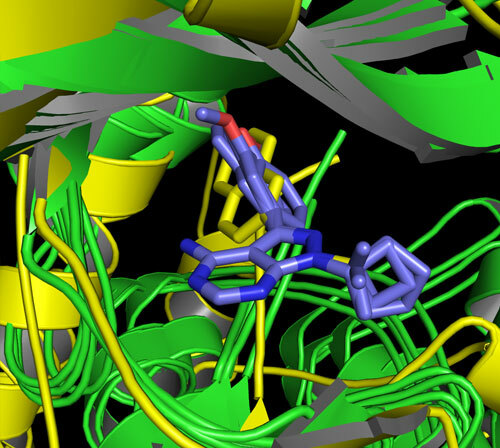 How now Schering-Plough, Nice purvalanol analogs as CDK2 inhibitors. Anything earthshaking here? Hmm… Not really, but look hard enough, and KP always learns something. Yep, hadn’t noticed the bromide as an isopropyl isostere before, but this is a continuation from US2006041131, WO2004022559. Schering has been beating on this and other 6-5 purine isosteres for some time (WO2004026877). There’s been plenty of Biotech sniffing around here. Vernalis has a similar CDK series (WO2004087707), and a Bioorg. Med. Chem. Lett. 2005, 863 (appears they’ve dropped the series). 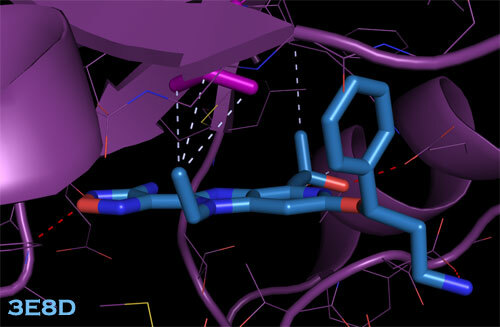 Ono has some c-Jun (WO2005035516) inhibitors on the scafford. So whats new here? Vernalis describes selectivity issues. Maybe they cracked that nut, otherwise its not obvious to me. Nice JAK3 / CDK2 application. Kinasepro notices that you folks patent an aweful lot of compounds, and chemotypes. Keeps me busy, but I have to wonder how you’ll find time to develop all these things.